According to Barclays Research, during 1981-2002 when Murthy was the chief executive, Infosys clocked a compounded revenue growth of 65 per cent and net profit growth of 64 per cent, notes Bibhu Ranjan Mishra. August 19, 2011. The crowd that had gathered at the convention centre of the Infosys headquarters in Electronic City in Bengaluru was slowly dispersing. In one corner, Sudha was waiting for her husband N R Narayana Murthy who was busy with old acquaintances and friends invited for his farewell. Sudha was ecstatic; Murthy whom she had 'loaned to Infosys' when it was founded 32 years ago, was finally returning to her that evening. The day her husband started Infosys, Sudha had stopped expecting him to spend time with the family. "His dream, his sleeping, his eating-everything was Infosys," she had told Business Standard then. 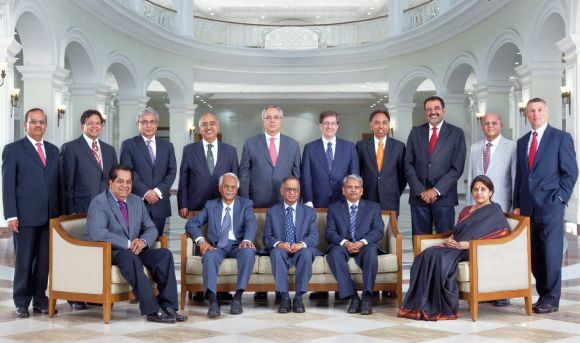 Image: Infosys' earlier board of directors. "If you take his blood and do an analysis, you won't find haemoglobin-it is only Infosys," she had added. Murthy calls the company his middle child (since Infosys was started after the birth of his daughter, Akshata, and before the birth of his son, Rohan). That explains why he was back as the company's executive chairman last week. His 'child' is in 'crisis' and needs a guiding hand. The company has gone off track in recent years. The one-time bellwether of the country's IT industry has slid to the third spot in terms of revenue, overtaken by a relative upstart, Cognizant Technologies (TCS is the largest). In this scenario, while the suddenness of his return may have come as a surprise, the move in itself has not. Image: Infosys Chairman N R Narayana Murthy. Infosys was at its prime when Murthy was at the helm. It had been seeing steadfast growth, something that most other players in the industry were often envious of. It was one of the earliest companies to see opportunities in IT outsourcing. Much of its growth came naturally as it was harnessing the early mover's advantage. It pioneered many things, including a high standard of corporate governance, giving an unbiased outlook to the shareholders and sharing its success with employees in the form of stock options. 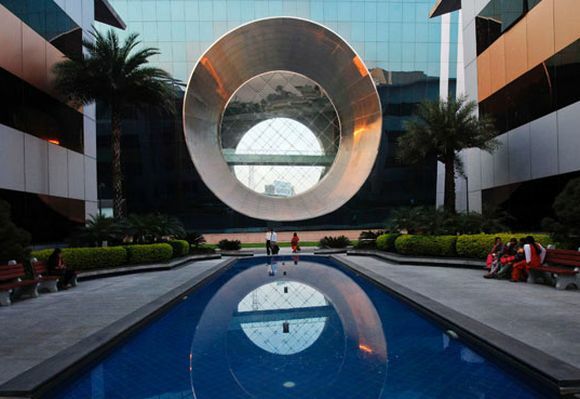 Image: Employees walk in front of a building dubbed the ''washing machine'', a well-known landmark built by Infosys. 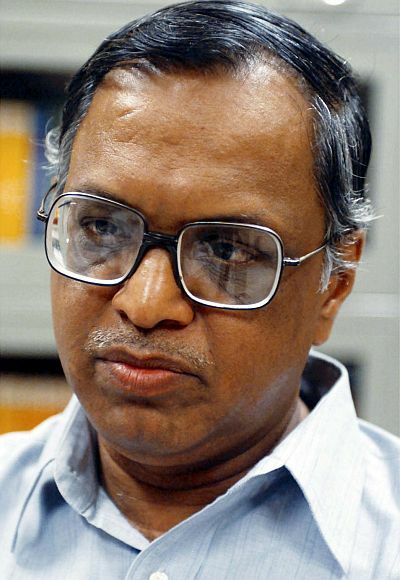 Murthy was in absolute command over the day-to-day operations of the company. The strategy to position Infosys as a premium player was his brainchild. In 1994, Infosys under Murthy even walked away from one of its large clients, General Electric, as it did not want to compromise on the billing rate. These early decisions shaped the company's future strategy. But the performance declined after Murthy stepped down. According to Barclays Research, during 1981-2002 when Murthy was the chief executive, Infosys clocked a compounded revenue growth of 65 per cent and net profit growth of 64 per cent. The growth pace continued even after he handed over the baton to Nandan Nilekani in March 2002. During the five-year period when Nilekani was the chief executive & managing director, the Bangalore-based company reported compounded annual revenue growth of 42 per cent and net profit growth of about 45 per cent. It was with Kris Gopalakrishnan that the tide began to change, largely because his taking over coincided with the global economic slowdown. 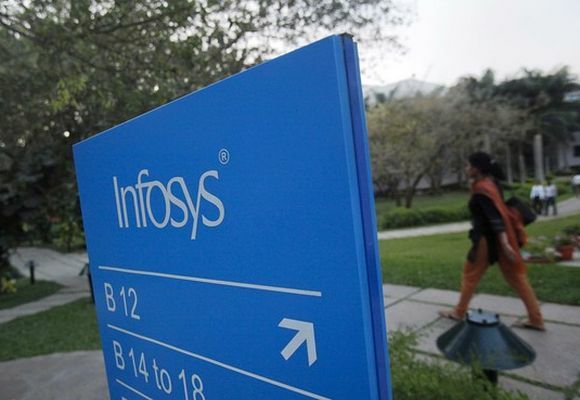 However, Infosys still managed to keep its head above water with revenue and profit growth of about 18 and 15 per cent respectively between 2007 and 11. The last two years have been the worst. Infosys is losing market share to competition. It is no longer being perceived as the IT bellwether and Cognizant, a company that was founded much after Infosys, has overtaken it as the number two offshore-centric IT services company. 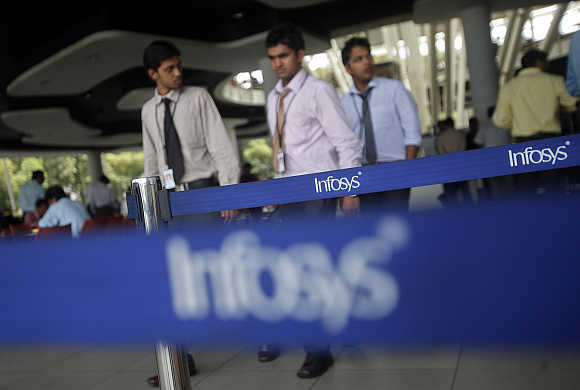 Image: Employees of Infosys walk past Infosys logos at their campus in the Electronic City area in Bengaluru. The strategic direction of positioning itself with the likes of Accenture as a consulting-led organisation is taking unusually long, while the morale of the management and employees seems to be at an all-time low. The company is adding more clients than many of its competitors every quarter. However, the growth of the existing account has been sluggish as compared to its peers, raising a question mark on its account-mining ability. For example, while Tata Consultancy Services has doubled its $100-million-plus accounts during the last 9 quarters to 16, Infosys has increased that number by just one to 12 in the same period. 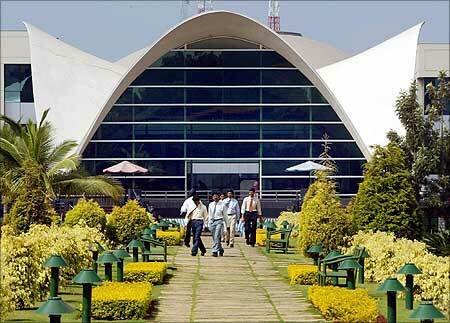 Image: Infosys campus in Bengaluru. 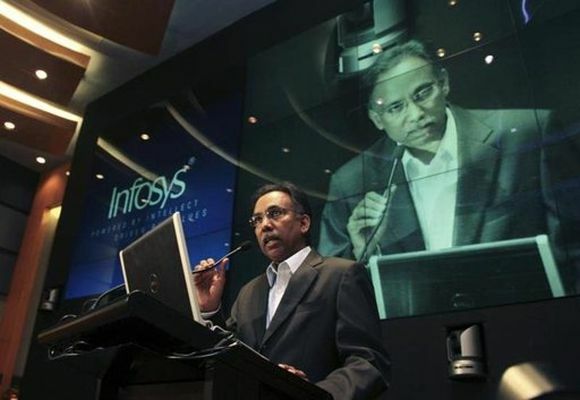 Infosys has now turned back to Murthy, but will it be able to catch up? "It may be the best decision under the given circumstances as trying to bring leadership at a C-level from the market would have required at least 4-6 quarters to show results," says B S Murthy, CEO of LeadershipCapital, an HR consultancy. Murthy's friends who have been a part of his entrepreneurial journey say age may have slowed him a little, but he has the enthusiasm, passion and commitment to turn things around for Infosys. He will hardly require any time to get started as he knows everybody in the system and has the respect of various stakeholders including clients, employees and shareholders. "You need a personality, a globally acknowledged figure to lead an organisation like Infosys," says Murthy. "You can't lose out on the perception of the people. "You need to be high on the recall and respect of the people, predominantly among customers, investors and employees," he adds. Image: Infosys chairman Narayana Murthy. However, according to industry experts, Murthy is unlikely to take any bold decision which may fundamentally change the strategy of the company. Instead, it is believed he may focus on refining the existing strategy and on ensuring its quickest possible implementation. "I believe Murthy will be more focused on putting the company's strategy to work, rather than making too many changes within/for the organisation," says Manish Bahl, vice-president and country manager for analyst firm Forrester. Agrees T R Madan Mohan, managing partner of management consulting firm Browne & Mohan. "The strategy has already been defined, implemented and has been pushed consistently by S D Shibulal and others. "His presence in the company would refine the focus, improve execution efficiency and reduce the friction when the implementation is going on," he says. Image: An employees walks past a signage board in the Infosys campus at the Electronics City IT district in Bengaluru. Murthy, meanwhile, is back to basics. In an interview to Business Standard, he said he would study the health of the company before taking any strategic decision. "After studying the situation and after collecting the data, certainly I would participate in a discussion on what has worked and what has not worked, and what needs to be changed," he had said. One of the biggest tasks before him will be to ensure the continuity of Infosys's PSDP (profitability, sustainability, predictability and derisking of their revenues) framework, which forms the bedrock of its strategy. In terms of profitability, the company's operating margin is at an all-time low. In the quarter ended March 31, 2013, it stood at 23.5 per cent. Image: Infosys MD and CEO S.D. Shibulal. This is happening because in its endeavour to position itself as a high-value consulting-led organisation, Infosys has lost its focus on the traditional 'bread and butter' application development & maintenance business, which still accounts for about 38 per cent of its revenues. Murthy may also relook at the account-mining engine. 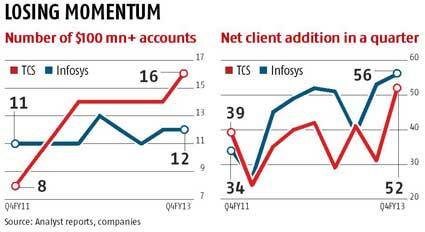 Despite adding numerous customers every quarter, the top accounts of the company have not grown at the same pace as those of its competitors like TCS, HCL and Cognizant. As a result, the company, long known for sticking to its revenue guidance, has been missing its own projections. After failing to meet the guidance a couple of times in the last two years, it has now stopped giving quarterly guidance altogether. 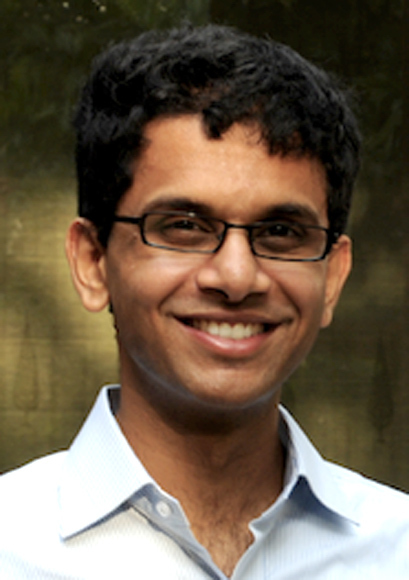 Image: Narayana Murthy's son Rohan. According to Madan Mohan of Browne & Mohan, Infosys has lost its ability to predict the business accurately because the funnels across verticals are not independent. Because of this, delay in decisions in one vertical is affecting the decisions of other verticals. There are several other areas that will require Murthy's attention. 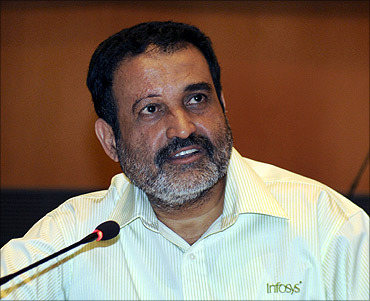 Infosys is largely seen as a US-led organisation. Its presence in Europe or the A-PAC region is minuscule and India only accounts for three per cent of its overall revenues. 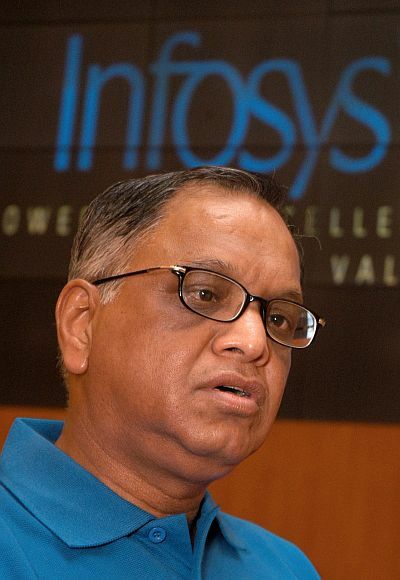 "Focus and execution are the two things what Murthy is going to bring to Infosys. "It is going to be a finer focus on what the company is offering, additional re-enforcement either in terms of inorganic growth or organic investments, and on execution efficiency and communication with the market," say Mohan.